I just can't get enough of 73P Schwassmann-Wachmann! It's the one I've been talking about so much on this blog, since a few people with tenuous grasps on reality claimed it was going to hit the Earth (and now claim it'll still hit in the coming weeks, though it's already passed us). But even without the nonsense, it's a very cool comet. A few years ago it split up into several pieces. 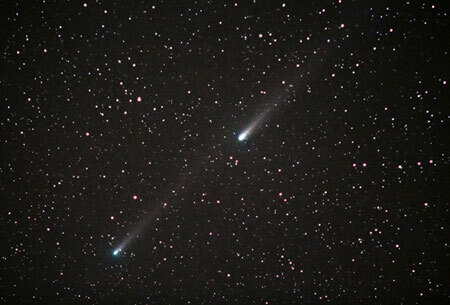 The picture above shows two of them as seen from Sydney Australia at the end of May. It was taken by a member of the Bad Astronomy and Universe Today discussion board (or BAUT). There are lots of other incredible images posted there as well -- but you have to be a member to see them. If you are not a member, then what are you thinking? You can go there as a guest, but membership is free, and we do nothing with your email (except, very rarely, to email members important messages about the board, like if it has to go down or something). BAUT has lively discussions on a broad range of astronomy and space subjects, and just a hint: we have big plans for it in the future too.